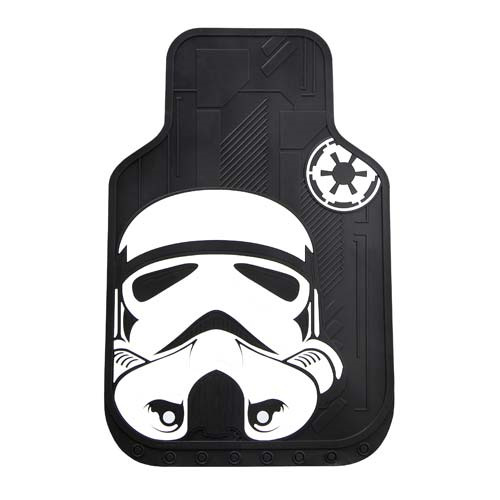 Come to the dark side by adding these cool floor mats to your car or truck! Order this fantastic Star Wars Stormtrooper Rubber Floor Mat 2-Pack featuring the infamous Stormtrooper helmet from Star Wars. These floor mats are universal fit and ultra-durable. Sold as a pair, they measure about 26 3/4-inches tall x 18 1/8-inches wide. Molded from the highest quality materials for long-lasting wear, they won't fade and are easily cleaned with soap and water. Made in the USA. Ages 17 and up.